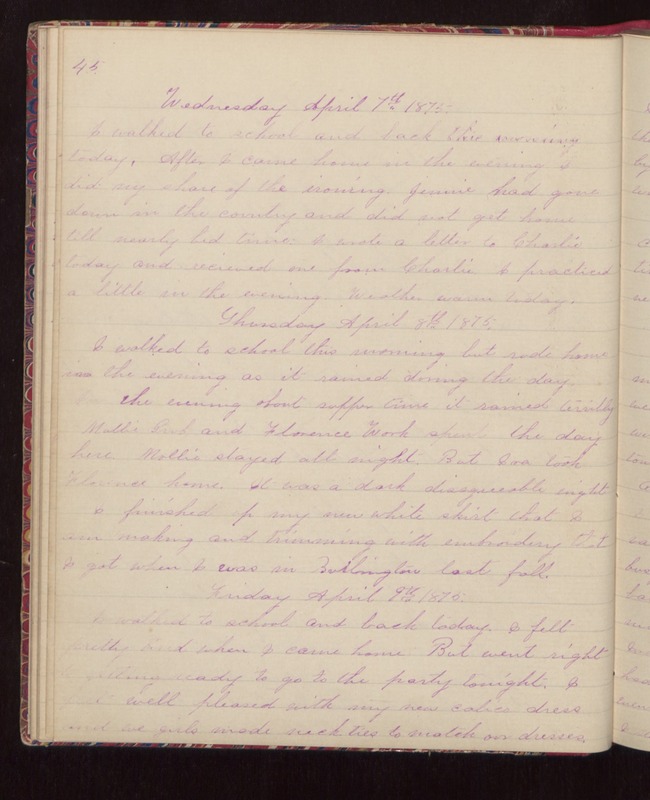 45 Wednesday April 7th 1875. I walked to school and back this morning today. After I came home in the evening I did my share of the ironing. Jennie had gone down in the country and did not get home till nearly bed time. I wrote a letter to Charlie today and recieved one from Charlie. I practiced a little in the evening. Weather warm today. Thursday April 8th 1875. I walked to school this morning but rode home in the evening as it rained during the day. In the evening about supper time it rained terribly. Mollie Grub and Florence Work spent the day here. Mollie stayed all night. But Ira took Florence home. It was a dark disagreeable night. I finished up my new white skirt that I am making and trimming with embroidery that I got when I was in Burlington last fall. Friday April 9th 1875. I walked to school and back today. I felt pretty tired when I came home. But went right to getting ready to go to the party tonight. I felt well pleased with my new calico dress and we girls made neck ties to match our dresses.